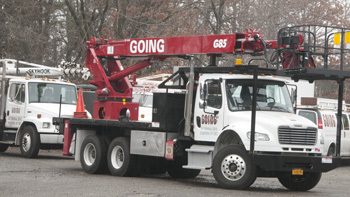 One of Long Island’s original sign companies, the Going Sign Company is a full service identification systems provider. 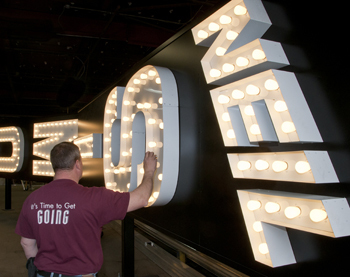 From manufacturing to servicing, the Going Sign Company has it covered, from Long Island to Manhattan and throughout the United States. We work individually with every client, whether it’s to design a single sign or a family of signs, from exterior and interior signage to wayfinding signage. Our design staff works closely with your team to utilize your logo and corporate identity to maximize your brand. Whether your project consists of one sign at a single location or numerous signs at multiple locations, we offer solutions to meet your specific needs. From design to installation, our team will ensure that your project is completed on time, on budget and to your full satisfaction. With over 18,000 square feet of manufacturing facilities, our fully trained staff has the capability to supply you with the highest quality of signage. Centrally located on Long Island, the Going Sign Company is perfectly positioned to service the wider New York and tri-state area with timely professional service. And as one of Long Island’s oldest established sign companies, our experience, workmanship and attention to detail will ensure that every sign we manufacture and install, meets the strictest quality control guidelines. Fully licensed and accredited, all of our signs are manufactured and installed to current building code requirements. Not only do we have a full fleet of vehicles to meet all of your needs, all of our field crews have received the proper training and licensing to perform the appropriate tasks, having successfully completed all required safety and OSHA Certification. 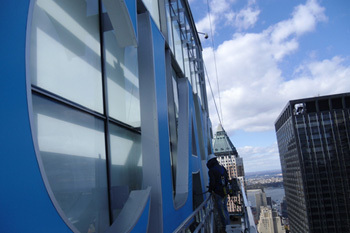 We are a fully licensed sign hanging contractor and our crane operators are NYC, NYS and NCCO certified. Our project managers can obtain all the necessary permits for any of your signage needs. Our fleet of vehicles can service any and all of your signage, from cleaning to full electrical upgrades. We are a fully licensed electrical contractor and we have the staff on-hand to handle your calls in a timely fashion.